Things that are typically out of sight tend to be out of mind. This old saying pertains to home repairs especially. One of the big ones that fall under that category would be our gutters. Wonderful in Florida for the ultra-rainy months, but what happens when it’s raining, and your gutters no longer drain? Can it be serious? How often should you have your gutters professionally cleaned? These questions and more will be answered for you today, along with expressing the importance of gutter upkeep. Leaking gutters/roofs/basements. Water that isn’t sufficiently drained to the ground can build up in the gutter, and eventually cause a leak in the roof itself. And even if the water is draining, it has to drain outward from home, otherwise, if a basement is present, it holds potential to be flooded. With these leak issues also comes the issue of mold which can cause an entirely new set of problems for the home. Cracked foundations. If a basement is not present in the home, but the gutters still are not positioned correctly (6-10 feet away from the house) or leaking, it can cause a cracked foundation in the home. Cracking is due to water, and a clean gutter ensures no leaks onto the foundation. General yard damage. Leaking gutters can cause slick mold to grow along the driveway, causing a potential slippery fall and just looks unsightly and isn’t good for the home. If you’re not sure that your gutters have become a problem, keep an eye out the next time it rains. Pools of water collecting are a large indication you may have an issue with your gutters. Also, signs of little critters, mainly bugs, that you never noticed before could give light to a new group of insects lurking in the clogs. Gutter maintenance is important, but how often should you have your gutters professionally cleaned? A big cleanout should be done at least twice a year or after a wetter-than-usual rainy season. In more northern states, ice is a big problem with clogged gutters, as it doesn’t make for an easy cleanup. You’re a bit luckier if you’re down south, specifically in Florida where ice never seems to be an issue. And some trees, such as pine trees, can cause gutter cleanup to be scheduled every three months due to the natural shedding of those types of trees. 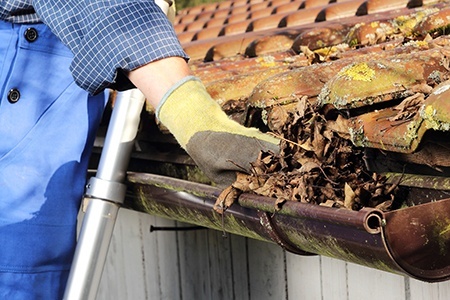 Cleaning out gutters can be an easy fix, but in some cases, it takes a lot more than just a free afternoon to clear them up. Professional roofing companies provide excellent assistance and get the job done thoroughly and right, leaving you with no worries about something that’s out of sight, and can be peacefully out of mind.